Asgard, Vanaheim, Alfheim, Midgard, Jotunheim, Svartalfheim, Hel(heim), Niflheim, Muspelheim. Nidavellir, Niflheim and Muspelheim are added, left out or replaced another world and even Yggdrasil (“the Tree” from Völuspa 2, the world-tree”) and Ginnungagap (the void that existed before creation) sometimes come up in lists! All of these follow the idea of “Nine worlds I knew, nine in the Tree”, but there are also more schematic versions of the nine worlds. As you can see the left picture by Francis Melville (I scanned it from his Book Of Runes) has ten worlds, the second picture from the left more lives upto the descriptions of the tree in the Edda with roots going everywhere, but also here, ten worlds of which only nine are numbered. The other two aren’t any clearer. 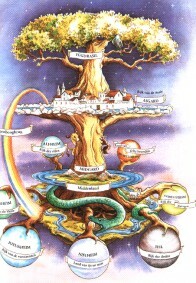 Yggdrasil is described in different places in the Edda under which in the Grimnismál. In the same text the domains of the different gods are named, which led people to conclude that the nine worlds can be found in the Grimnismál. This is not the case! As a matter of fact, the nine worlds are not named or explained anywhere in the ancient Nordic literature that came to us. Even when Gangleri asks Hár about other worlds than that of the gods in Gylfaginning 17, the answer is not what we are looking for. This is the major reason why people try to fill in the picture themself which as result: many different lists most of them without much explanation how people came up with the line that they give. It may be a better idea to work the other way around. Most people will agree on the fact that the Nordic peoples had the numbers three and nine in high esteem. There are many threes and nines in the mythology. Both numbers come back in the worldview. The most simple division of the cosmos in the Northern mind is heaven, earth, underworld. It is only logical to use this division in regard of the nine worlds too. This brings us to another logical conclusion: there must be 3×3 worlds. Most people who write about the nine worlds do not pay attention to this logical thought of three times three. Two of these divisions in these three are easy; Asgard, the realm of the gods or the upper garden and Midgard, ‘our realm’ or the middle garden. Asgard seems to have two meanings in the texts, both that of Asgard and Asaheimr (see below). Midgard is mentioned in the story about creation in both the Prose Edda (Gylfaginning 9) and the Poetic Edda (Grimnismal 41). The latter says: “and of his [Ymir’s] brows the gentle powers formed Midgard for the sons of men”. This is why Midgard of often bluntly said to be the realm of mankind. I will come back to this. So what about the third cosmic area? The most common name for that is Utgard. This term also comes from the Prose Edda (Gylfaginning 45). Most scholars agree to this term, even though Utgard is not really a place, but a castle. As you may see in the images above, Utgard is not regarded as a ‘gard’, but the sum of different worlds. It is strange that Melville gives Asgard and Midgard and puts all the rest in, or as, Utgard. In an online discussion about this subject, someone made the just remark that the lists are actually strange, because everybody uses different terms right through eachother. 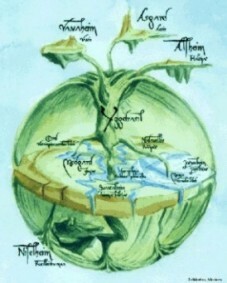 There are ‘gard’s (‘gardens’), ‘heimr’ (worlds) and ‘hallr’ (halls). In this case all of the castles or places of the gods would be halls and the cosmic division of three, gardens. 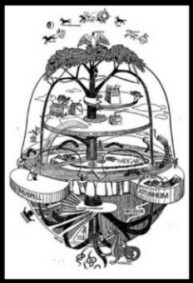 The nine worlds consequentally should all be worlds/heimr. A very interesting starting point, but it results in the conclusion that you will not easily find nine ‘heimr’ that logically fit in a nine-world-scheme. What do we have to far? In Asgard, we have the world of the Aesir, called “Asaheimr”. Asaheimr is named in the Ynglingasaga 2 (the first part of Snorri Sturluson’s Heimskringla or ‘history of the Norse kings’). Second in Asgard is the world of the other gods: the Vanir and they live in Vanaheim. The term “Vanaheimr” also comes from the Ynglingasaga. I will come back to the third heimr of Asgard later. Midgard, in which we at least find the world of mankind and beings on ‘our plane’, suggestions below. Utgard, the outer garden is the underworld with the ‘evil’ giants and Hel. Again see below. In the ‘3×3 thought’ this is the best list so far. Some names do not need discussion, other might. As you can see they are all “heimr” instead of Walhalla. This ‘problem’ can be ‘fixed’ with a quote from the Grímnismál: “Gladsheim a fifth is called, there gold-bright Valhall rises peacefully, seen from afar” (verse 8). So if Walhalla is a part of Gladsheim we can use that term too. Then we come to Midgard. I have not been able to locate the term “dvergheimr” (world of the dwarves) and “álfheimr” isn’t an often-used term either, but it is named in the earlier referred to Gylfaginning 17. Sometimes Alfheimr is divided in light and dark elves worlds, like in Grimm’s Deutsche Mythologie: “The above-named döckâlfar (genii obscuri) require a counterpart, which is not found in the Eddic songs, but it is in Snorri’s prose. He says, p. 21: ‘In Alfheim dwells the nation of the liosâlfar (light elves), down in the earth dwell the döckâlfar (dark elves), the two unlike one another in their look and their powers, liosâlfar brighter than the sun, döckâlfar blacker than pitch. '” (This comes from Gylfaginning 17, earlier the same chapter says: “It is said that to the south and above this heaven is another heaven, which is called Andlang. But there is a third, which is above these, and is called Vidblain, and in this heaven we believe this mansion (Gimle) to be situated; but we deem that the light-elves alone dwell in it now.”). Some people say that the light-elves are elves and the dark-elves or svartalfar are called dwarves. Svartalfheimr is a ‘heim’ that is mentioned frequently, but I haven’t been able to trace the source of it. It is supposed to be located in the earth. And in Utgard we find the two worlds of two kinds of giants (fire- and frostgiants), Muspelheimr and Niflheimr; together Jotunheimr. Muspel- and Niflheimr are also mentioned in the story of creation to be found in the first chapters of the Gylfaginning. Hel(heim) is the place where dead people go to and where Hel, a daughter of Loki rules, an ‘underworld’ pre-eminently. I prefer to refer to the three levels as ‘gards’ , ‘gardens’ and here we have the upper, middle and outer garden. Mankind obviously lives in Midgard and “Mann(a)heimr” is a good term for our world. On the same plane we have light and dark elves/alfar, both in their own world. Muspelheimr is the realm of the dark fire giants and Muspelheimr that of the frost-giants. Helmheimr is the world where people can go to when they die. Gylfaginning 34 suggests that Hel has her world in Niflheim, but if we put it like this, a human being can be on all three of the planes, which may fit well enough in the Northern picture. Not totally convincing, but let me know when you find or figure out something better! Here visually, this is not my best computer-skill, but the idea is there. I’m no scholar, but in the old stories I was told, the Aesir and Vanir werre from different realms and built together, after their war was done and the intermarriages complete, a realm in their heavens for men of noble character (commonly Warriors, but also women who died in childbirth). Then the Giants, divided by their elemental natures, lived in two realms similar to the Gods, but warped – like Muspelheim and Niflheim were mirror-realms of Asaheim and Vanaheim. The Jotun were creul, malicious and dangerous to anger in Muspelheim, whereas the Jotun of Niflheim were cold, calculating and distant. Loki was a Giant, not a God, despite his commonly being found in the Vanaheimr. Man, crafted by the Aesir, Elves crafted by the Vanir, and Dwarves, crafted by Giants, all lived in neighboring realms on one plane of existence. The three were native born to the Middle Garden – Midgard. Death in battle or childbirth led to Valhalla and the God Odin; Death by old age led to Niflheim and the Goddess Hel; Death by any other cause led – based on a judgement by the Jotun – to one of their realms and to torment and labor enslaved for eternity under the thumb of the Giants. At least that’s the Tales I was taught. Oral history has its hangups, so contact me if I messed anything up rr whatever. I gotta be able to tell my kids the Stories one day. Xan, I am no scholar either, just somebody thinking over some things. The above is not suppost to be a retelling of old tales, rather a (modern) scheme how one can see things. If you want to tell the tales to your children, I would say just read from the Eddas, the sagas and all other literature that we have. Since these stories are myths, there is no right or wrong way of telling them, but all this has little to do with the article you commented to. Hello, I am writing an Article on Valhalla for my Charity Magazine and i was wondering if I may have persmission too use one of the beautiful images on this site? i hope its ok to pass this along: raven kaldera has a wonderful map of the nine worlds. a spiral map accounts for the geography of the lore, without inventing words like ‘mannaheim’. from asgard in the east, down to ljusalfheim in the south, then vanaheim in the west, jotunheim in the north, coming around to midgard in the east below asgard, then muspelheim, svartalfheim, niflheim, and hel once again in the east, two levels down from asgard. When you read my article you will see that I did not invent any names, but I indeed had to look for some. Many thinkers only look at the geography, not at the names and I wanted to present something logical, hence the division between gardr and heimr. 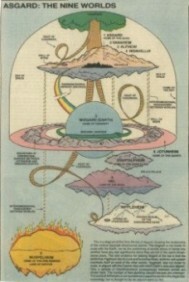 The spiral sollution you point to has objections too (even though I would hav to read the book to learn about the whole scheme of course), such as, how do you travel from Asgard to Midgard, by passing two other worlds? In any case, my scheme is not a definate sollution, just a suggestion and to me (of course) the most logical one. Actually Xan makes lots of sense….his oral story also supports Roy’s view. Thought you would be interested to see this…. : seems to match your ideas perfectly!